Being thoughtful was a common theme in a recent clergy social media workshop. But when you’re communicating, how can you ensure you are being thoughtful? 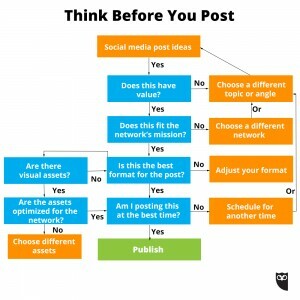 This chart looks at what you should ask before you post on social media, but it’s applicable for all communications. Just replace the word social media with your applicable communications tool, email, blog post, newsletter, sermon. Clicking on the image makes it full-size, but if it’s easier, here are the five questions. Is this post valuable to my social media followers? Is this post contributing to this social network’s mission? Is the format of this post optimized for the social network I’ve selected? Does the quality of assets match the standards of my social media presence? Am I posting this at the best time? A deeper explanation of the questions to ask before you post is on the Hootsuite blog (where we borrowed this from). Do you have any questions you ask yourself before communicating? Please share in the comments.